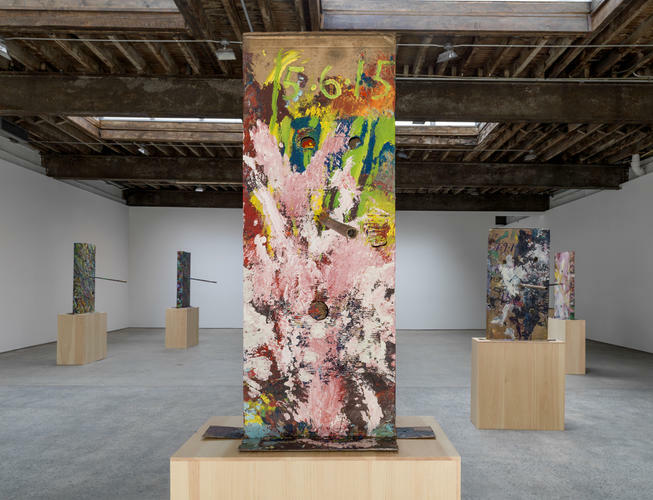 Twisting the formal language of both his chosen objects and the painterly signifiers he has built up over the course of his career, Mark Grotjahn returns to Anton Kern Gallery for his fourth solo exhibition with the New York Gallery. Building on the sculptural objects presented last year at the artist’s exhibition at the Nasher in Dallas, the works on view take Grotjahn’s interest in cast-off materials and repurposed objects, the show turns the artist’s frequently reoccurring subject, the cardboard box, into a container for his own aesthetic interests. 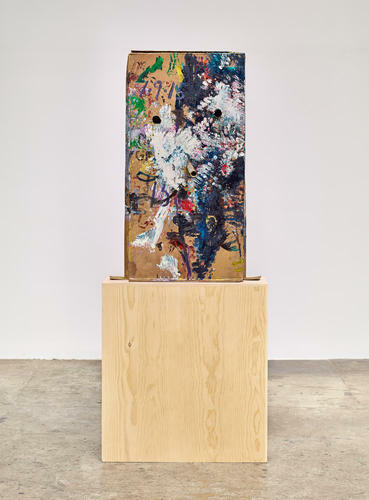 Referencing notions of a mask, Grotjahn’s pieces here approach trash as a starting point for a generative, labor-intensive practice that belies the work’s simplistic presentation. 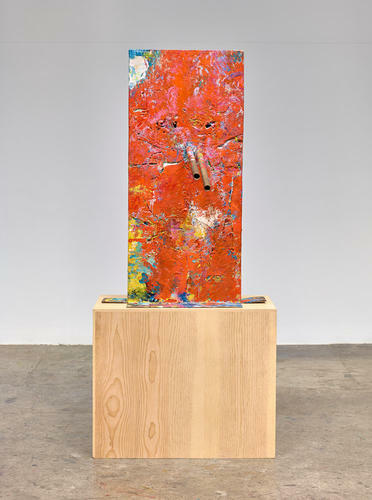 The works are first cast in bronze, and then used as a palette for Grotjahn’s color palette and swirling, occasionally blurred hand. 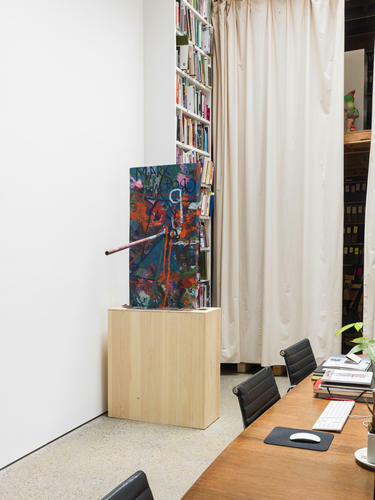 The pieces each carry their own abstract thematics, from thinly traced, sharply contrasting lines to works like Untitled (Orange over Mountain Walk, Italian Mask M30.g), which covers much of the surface with a single, caked pour of orange paint. Considering the often meticulously trained slashes of paint that define many of Grotjahn’s canvases, the works here take what seem to be an almost contrarian approach to Grotjahn’s other work. Much in the same way that he turns his focus to cast-off materials, these surfaces seem to mimic the chosen format’s original destination, privileging a more immediate, expressionist hand that could adorn any cardboard box used as a drip mat or cast-off material. 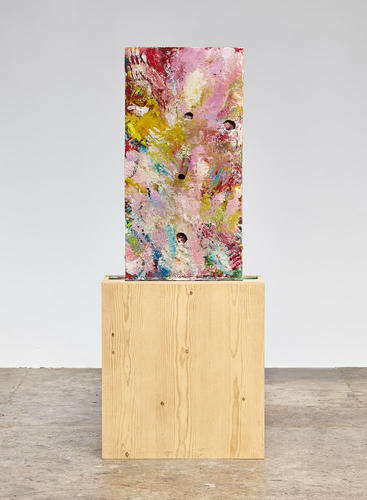 The result is a surface that seems both child-like and darkly ritualistic, drawing on broad anthropological ground to support his own painterly practice. 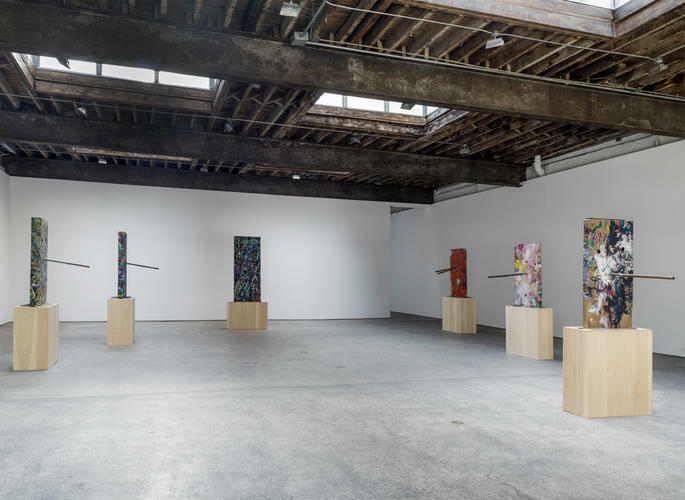 Yet it’s the single pole, jutting out from each of these works, that gives each piece a sizable portion of its tendency towards witty inversion. With a single affixed object, Grotjahn’s dedication to lighthearted figuration also turns the work from a relatively flat, static work into an exercise in depth, pushing the viewer into a more considered orbit around the piece. These jaggedly affixed forms demand their own moment of consideration, shifting along with the viewer’s vantage point in a way that offers slight comparisons to a sundial, tracing position and time across the “face” of the piece. Offering a look at Grotjahn’s formal irreverence and incorporation of diverse threads of historical abstraction, the exhibition is on view through October 29th. This entry was posted on Saturday, October 10th, 2015 at 12:00 am	and is filed under Art News, Featured Post, Show. You can follow any responses to this entry through the RSS 2.0 feed. You can leave a response, or trackback from your own site.